Hi all and welcome back! I can’t believe it’s done. It’s Wednesday at about 7pm and I seriously just finished. I have 5 hours to spare! Nothing like waiting until the last minute, huh??? It was a stressful six weeks if I’m being honest. In case you are new here, I am one of the guest participants in the One Room Challenge sponsored by Calling it Home. I am second guessing everything now and still trying to move things around. But, overall I’m super excited this is done and we don’t have the awful mess that it was before anymore. So, without further ado, here is the hall bathroom makeover! I got my plan together for where I wanted to go and it looked like this. This was the first time I used a program to draw a room and plan it out and it was so helpful in sticking to a plan. I gutted the entire space. We had a contractor set the new shower pan and build the new half wall, then I got to work. I had detailed posts on some of the project but will have the other projects coming very soon. So, after prepping the floor, tiling everything, building a vanity, picking out accessories and painting, we have our new bathroom. Look back over the progress! Whew, I learned a LOT! Crazy! 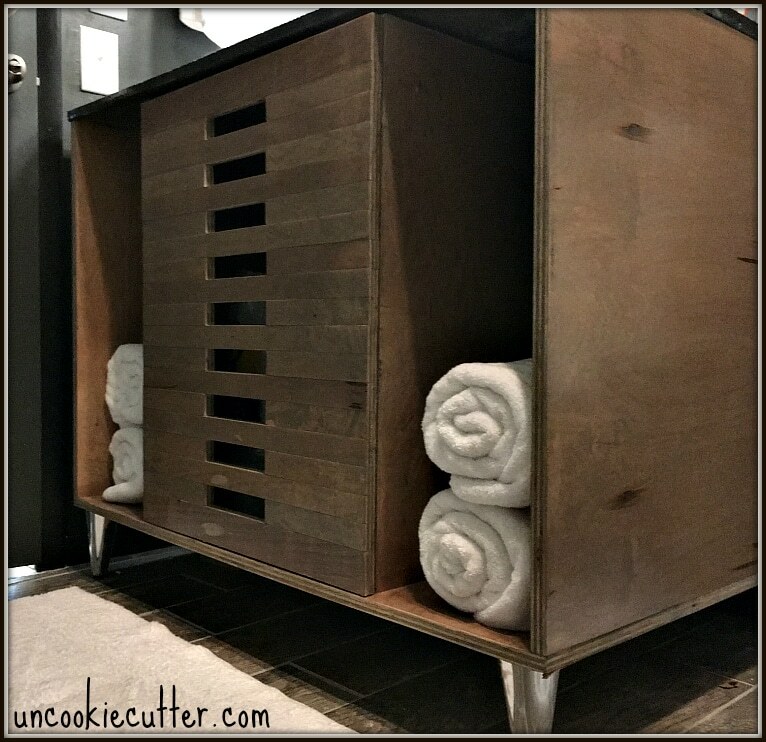 I’m still planning a few things, like maybe adding two drawers – one on either side of the door? Or a shelf on either side? I don’t’ know, but the vanity still needs something. Thanks so much to my generous sponsors! 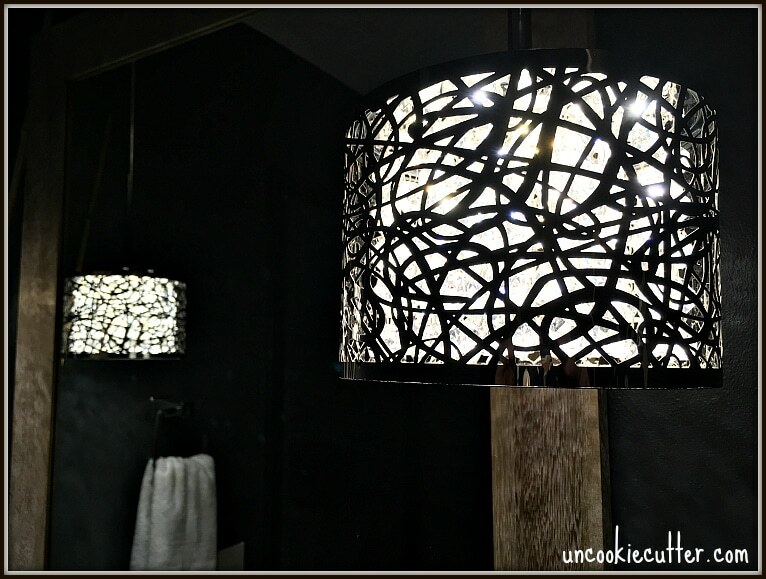 I’ll have more info in the specific project posts, but lights were provided by LampsPlus, plywood by my favorite plywood – PureBond and furniture feet for the vanity by Osborne Wood . They mad this journey so worth it, so go give them some love for me! See my full shopping guide for this room HERE. Well, that’s it for now. Thanks so much for joining me on this six-week journey! Will I be back in the spring? I have no idea ;). 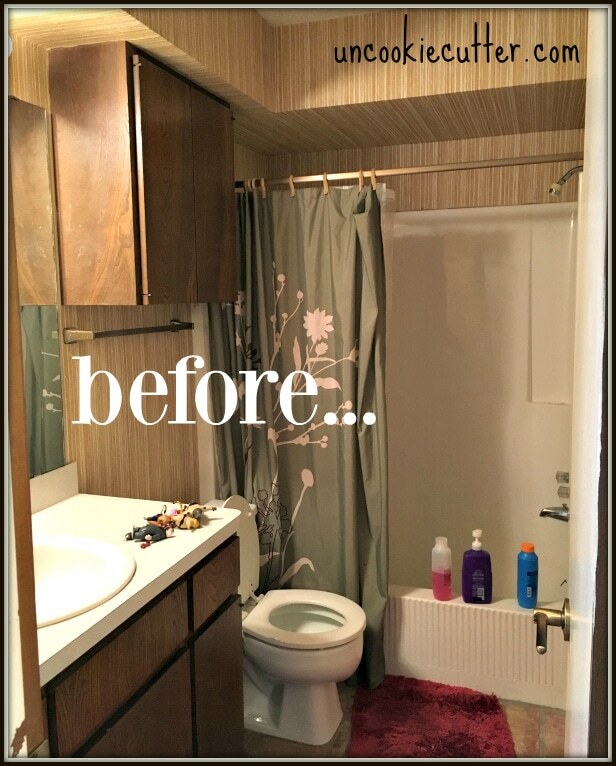 Hall Bathroom Makeover Final Reveal! Wow! That was a GIANT transformation!!! I can’t believe it’s the same room! It looks AMAZING! 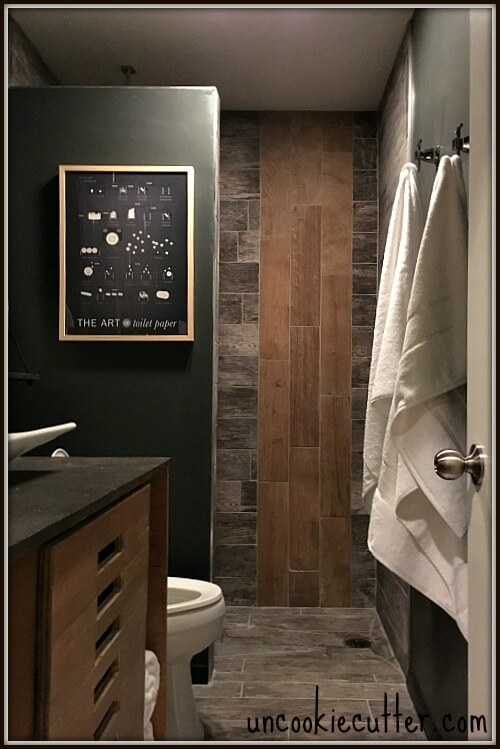 I love the deep, dark color with the earthy mix of wood and stone. You did a great job! And, I’m with you… So glad it’s done!! I just finished today too! Oh fun! Thanks so much Karrie, going to head over and see yours now :)! Love how your newly updated bathroom turned out! Great job! Oh my gosh, it looks amazing!!!!! That shower! That sink! Those pendants! That cabinet! 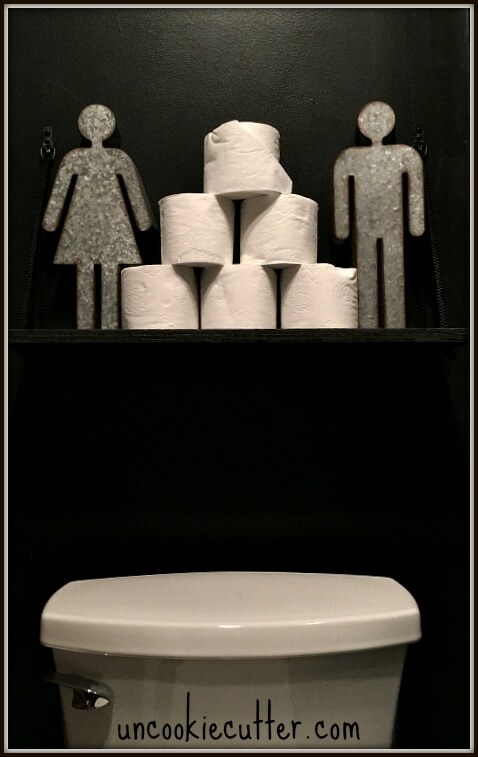 And I adore the art of toilet paper pic!! 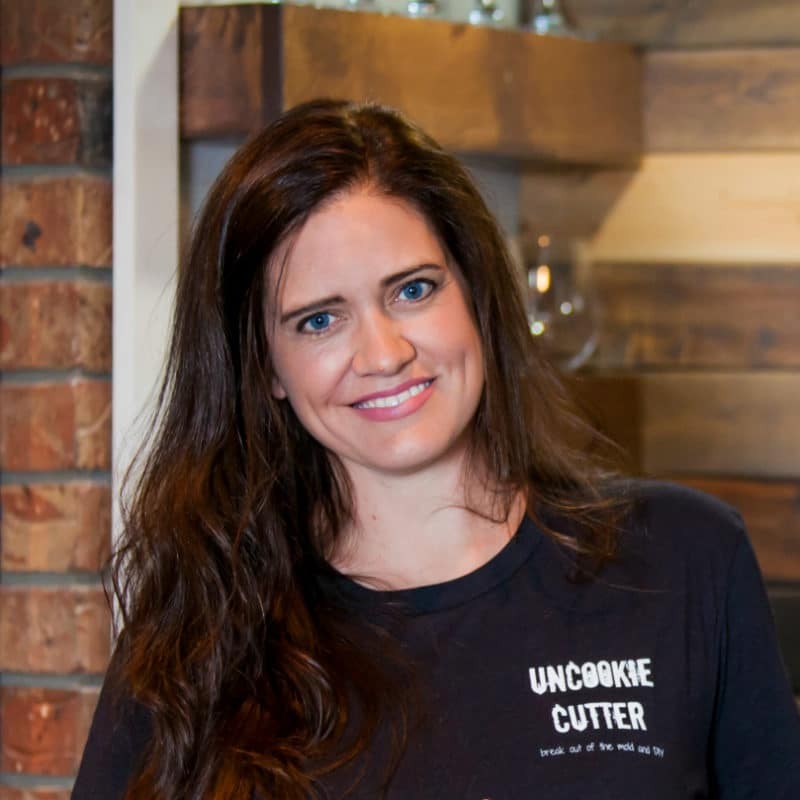 Incredible – you’ve outdone yourself girl! April, this turned out amazing! I love that vertical tile going up the wall, great job!! Thank you Roxanne!! I took a risk with that but love the way it turned out. I was physically laying the tile saying “this is going to be a mistake”, haha. I love how this turned out. It’s warm and smooth and I love all of the subtle hints of gold and sparkle. What a great, great makeover! Great work, my friend! Thanks my friend, and back at cha!! Come on! Thanks again for your help! It looks AMAZING April! Fabulous job, you would never know it was the same space!! Wow. I LOVE it! The dark color is stunning. 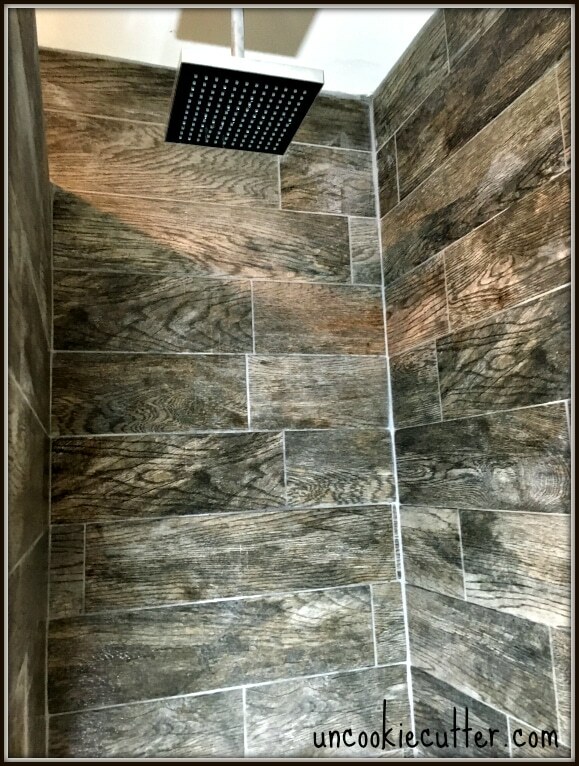 I love the wood and metal mix and the shower tile is beautiful. It’s an amazing transformation! Great job! Killer drama! I feel like I’m in a boutique hotel! You did it! Hooray! The tile elements are so interesting, and totally make the space. Great job on another transformation! WHAT?!?!?!?!?!?!??!?!?!!!!!!!! April!! You are a rockstar!! I cannot believe my eyes. This is an amazing transformation – you knocked it out of the park. Brava, my friend!! Oh my gosh, I can’t believe this is the same bathroom! It truly looks like you are in a spa! I love the dark color with the wood tones. You did so much and still finished on time! Awesome job! Thank you Robin! Yay for black walls, haha! what a difference, april! so modern and sleek! love it! Gah girl, you are GOOD! This looks like a retreat. 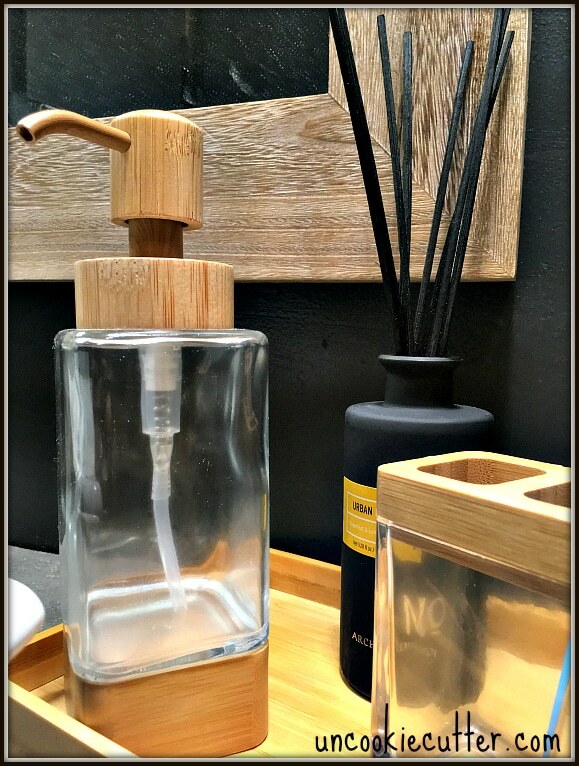 I want to vacation in this bathroom…so good! It looks so good! I’m so impressed – it looks so modern and fancy. LOVE it! Wow! I can’t believe it’s the same room! What a transformation! I love the vanity!! Oh my goodness! It is so dramatic and gorgeous; it looks like a high end hotel bathroom! Stunning makeover!! Thanks so much Krista, I’m so flattered :). April, you seriously hit this out of the park. Out. Of. The. Park! 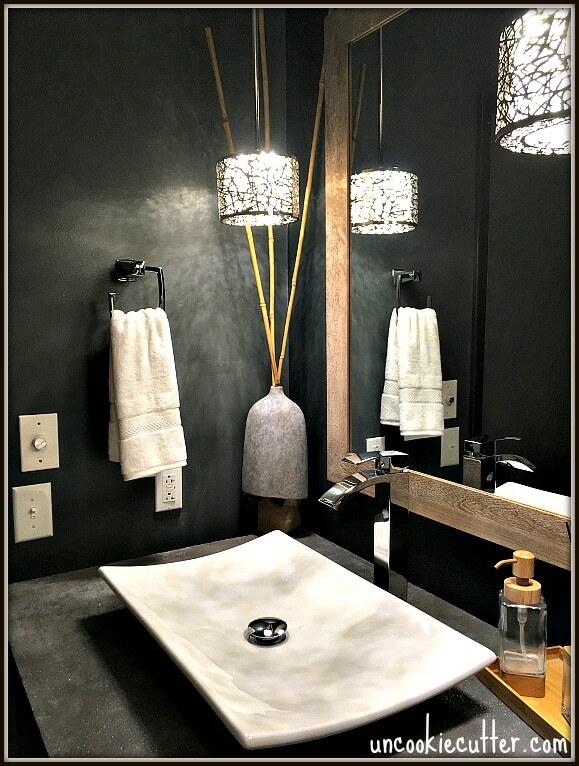 I am in love with the dark walls, the wood-look tile, your vanity… it feels modern, sophisticated, a little moody in a good way. And those pendant lights!!! Gorgeous! Wow! What an incredible transformation! It is so sophisticated now! You worked hard! It’s awesome Be proud! The wood tile walls are amazing!! This was really unexpected and I LOVE it! 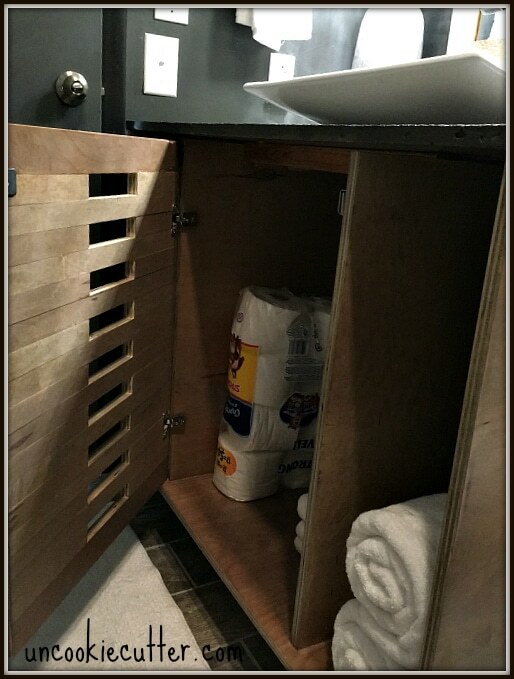 Great job on building the vanity, it looks stunning and perfect for the space. Love the lights too! And the dark walls! Seriously, I could just keep listing all the beautiful touches with a bunch of exclamation points but I’ll stop. And the different directions of the tile! Ok, couldn’t help it. You should be so proud and excited to see the rest of the “how-to’s” for this space. Oh you are so sweet, thanks Rachel!! I’m not usually a fan of dark spaces but this is awesome! I love the moodiness and all your decor choices! Thank you so much Breanna! I was nervous about the dark too. April, this is sooo good and sooo you!! I love it! The little metal people are so much fun, and I love all the black and wood together. And the light fixtures!! What a perfect bathroom! Can you tell me how you painted the walls and what colors you used? Yes! So sorry I left that out. 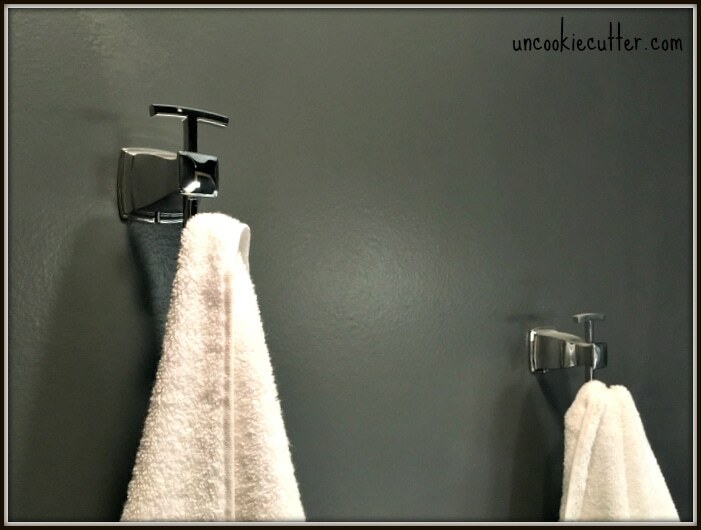 I used Valspar Signature Interior Semigloss paint but used the color “Black Majic” from the Olympic line of paints (I just like Valspar paint better) on the wall behind the vanity and toilet only. On the other three walls I used Valspar Signature Interior Satin in “Knight’s Armor (Olympic)” on the other 3 walls. The ceiling is Bohemian Lace from SW, also Valspar Signature Interior Flat Matte. Hope that helps! Gloria, I think it looks textured because of the shadows from those awesome lights! The shadows are so cool, truly! 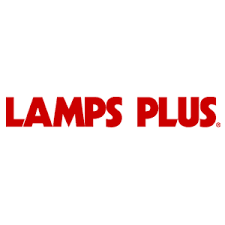 I think you’re right…I’m getting those lights! I love love love them, I basically planned the whole room around them :). That was night and day, seriously! Such a sleek and beautiful makeover. Enjoy! I can’t even believe that’s the same room!! it’s bold and dramatic and I love it! Great job on this room. It is very unique and different, and I am very impressed at all that you accomplished in this space! 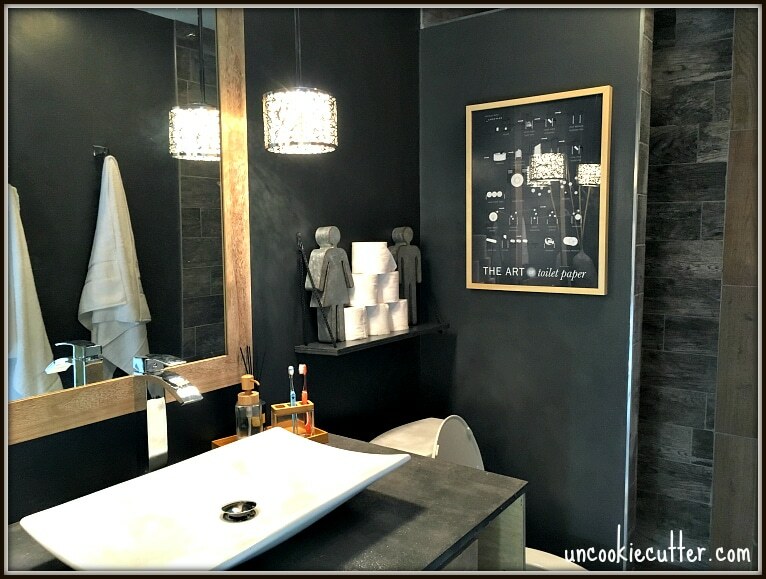 April – we love the dramatic transformation of this beautiful bathroom! 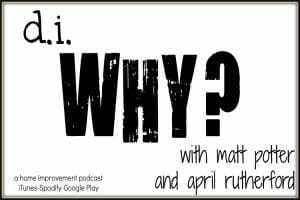 How did you accomplish so much in just 6 week? Fabulous! I think I might be dead, not sure…lol. Thanks ladies! What a fabulous room you created! It’s so beautiful. I love the dark walls with the wood tones. Oh My Goodness April!!!! You would never even believe where that bathroom started out. It is so sleek and refined now. I love the dark and moody feel to it. You did a fantastic job! April, I seriously can’t believe what you accomplished in this room! You completely transformed it, and I am SO impressed!! The tile you used in the shower and the pattern are so beautiful. Job well done – you deserve a billion high fives! Thank you so much Jenny! I am glad it’s OVER, haha. Thanks Mary! 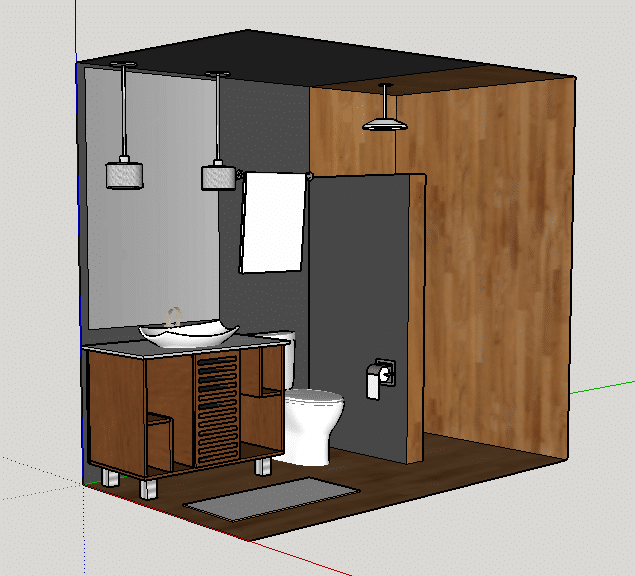 I’m writing the tutorials now, first one up is going to be the walk in shower (I hope)! Thanks for stopping by!